Your daily scoop of what State of the Union is watching today, July 24, 2014. 1. Israel-Gaza conflict. A strike on a U.N. shelter in northern Gaza has killed and injured multiple people. 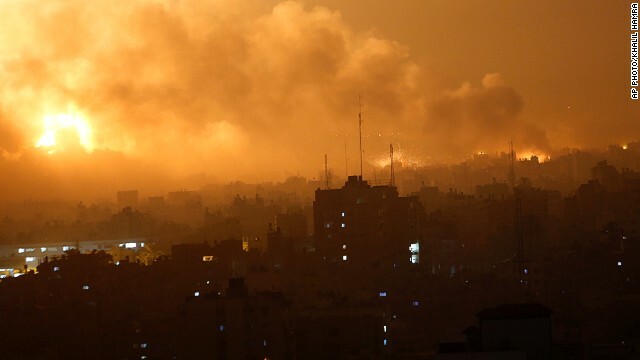 The Israeli military acknowledges was engaged in combat with Hamas in the area of the shelter at the time, but that it is reviewing the incident and a rocket fired by Hamas could be responsible. U.N. Secretary General Ban Ki-Moon said he was "appalled" by the violence. Meanwhile Secretary of State John Kerry is continuing his shuttle diplomacy in the Middle East to try and broker a cease-fire between Israel and Hamas. 2. Ukraine. The country's prime minister and his cabinet have announced their resignation. Prime Minister Arseniy Yatsenyuk said he was resigning because of "the collapse of the coalition and the blocking of government initiatives." Yatsenyuk and his Cabinet will stay on as an acting government until Ukraine's next round of elections in October. The announcement came as more bodies from Malaysia Airlines Flight 17 were returned to the Netherlands. The passenger jet was shot down last week last week in an area of Ukraine controlled by pro-Russian rebels. All 298 people aboard were killed. 3. CNN freelancer abducted. A Ukrainian journalist working for CNN is being held by pro-Russian rebels. Armed men kidnapped Anton Skiba outside a hotel Tuesday in the rebel-controlled city of Donetsk. CNN initially chose not report his detention while making efforts to obtain his release. Since Skiba is still being held, CNN is now publicly asking those who are detaining Skiba to release him immediately. 4. The midterm engagement gap. The Republican Party has a sizeable advantage in voter engagement with the midterm elections just four months away. According to a new Pew Research Center poll, 45% of registered Republicans say they are enthusiastic about voting in the fall, compared with 37% of Democrats. But the gap is narrower in GOP's 13-point enthusiasm advantage in 2010 and the Democrats' 17-point advantage in 2006. One area where Republicans and Democrats are dead even: who should control Congress. The poll found that 62% of voters in both parties say control of Congress will be a major factor in how they vote.